How does self-levelling suspension work? Self-levelling suspension essentially works by providing additional support when under load. This support is intended for reducing the back of your vehicle sagging, as well as assisting ride stability, safety, and comfort. 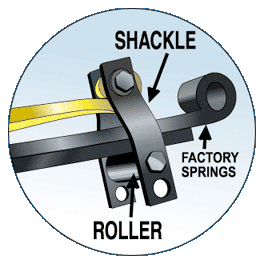 Supersprings utilize a unique, patented design, featuring a dual-roller shackle. This roller enables the shackle to travel independently of the standard leaf springs, until these springs are under load, at which point the shackle engages the additional springs, thereby providing added support. In cases where a vehicle frequently carries heavy loads, these rollers and shackles can also be adjusted (ideally at the time of installation) in order to provide full time support, and reduce the travel of your vehicle’s rear. Self levelling suspension will make a noticeable difference to your vehicle’s handling while carrying heavy loads or towing. Supersprings feature high quality materials and a unique design, and are different from many other varieties of self-leveling suspension such as airbags, as they do not require regular ongoing maintenance or adjustments, nor do they require any welding or drilling for installation.